Finding the best places to keep your orchid isn’t as hard as you think. Although they're tropical plants, orchids grow in many different environments. They’re sophisticated and beautiful on the outside, but on the inside, they are strong adaptable plants. But though they’re tough, they’re not invincible. 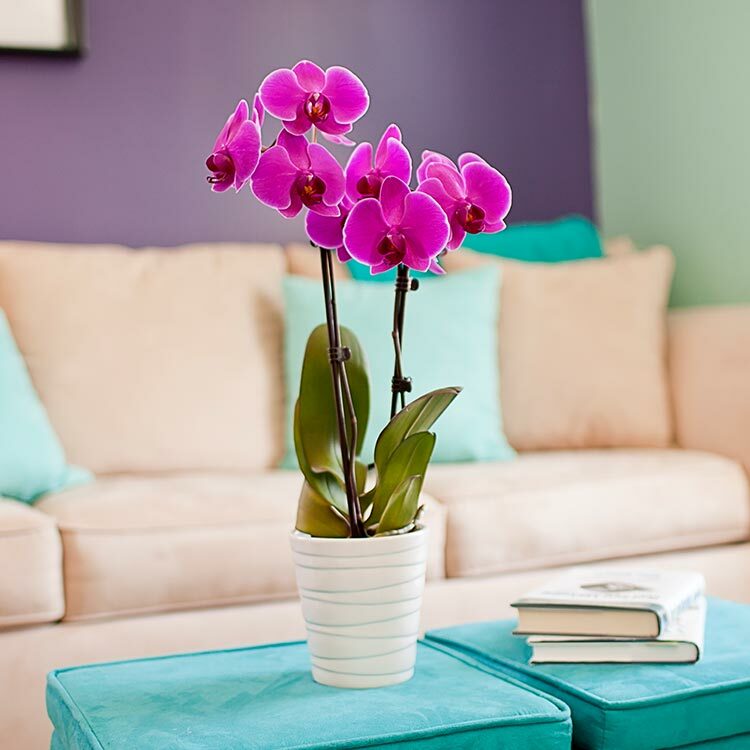 Orchids thrive in the sunshine, and the living room tends to get the most sunlight in your home. Indirect sunlight is best. So one of the best places to keep your orchid is near a north- or east-facing window. If your living room has west-facing windows, it’s best to place it farther away from the window on a table or shelf. If you prefer to place your plant closer to the window, make sure the window is draped with a sheer curtain to block out the direct rays of the sun. 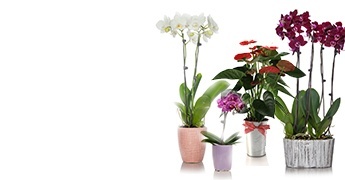 Phalaenopsis orchids originated in the tropics, which means they love humidity. What room of your home tends to be the most humid? The bathroom. The steam and heat from your bathroom shower will keep your plant hydrated and warm. If your bathroom doesn’t have any windows, you should take your plant out of the room for part of the day. Place it in another area of the home with indirect sunlight. Rotating your plant between the bathroom and another room of your house also discourages mold growth from too much moisture. An orchid is a simple, yet stunning way to beautify your dining room. And since dining rooms tend to be connected to kitchens, your plant can benefit from your kitchen’s warmth. If your kitchen windows face south or west, the afternoon sun will provide the warmth. Your orchid will benefit without being exposed to sudden warm blasts from opening and closing the oven door. When deciding where to place your orchid in the dining room, be sure to keep it far from any fruit bowls you may also have in the room. The ethylene gas emitted by ripening fruit can cause premature dropping of buds. Do you work from home? Adding a plant (or two) is a wonderful way to liven up your workspace. It may even increase your creativity and productivity. Home offices are also one of the best places to keep your orchid because they tend to be well lit with natural sunlight. This will help your orchids get all the light they need (just be sure to keep an eye on your plant’s leaves to ensure they’re not getting sunburned). What’s better than waking up to a beautiful orchid flowering on your nightstand or gazing at an orchid resting near a window? In addition to the kitchen, your bedroom is another room that stays toasty, and like the living room, tends to get a lot of light. If you place your flower near a window, make sure it is insulated against drafts and faces north or east. 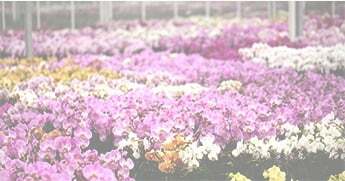 The most important thing to remember is that orchids thrive in indirect sunlight and don’t like excess water. The good news is that there’s a really simple way to water an orchid. Three ice cubes, once a week, will keep your potting soil moist and your plant thriving. Orchid care is easy. 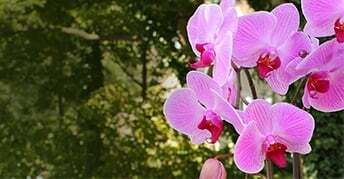 And the beautiful and vibrant look an orchid can bring to your home is unmatched. 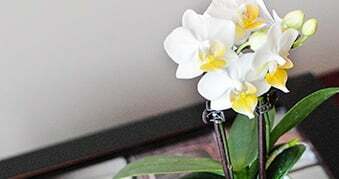 If you use the above placement tips, you’ll help to keep your orchid blooming for a long time. Looking for some decor inspiration as you think about how to incorporate orchids into your home? Check out our new spring decor lookbook!